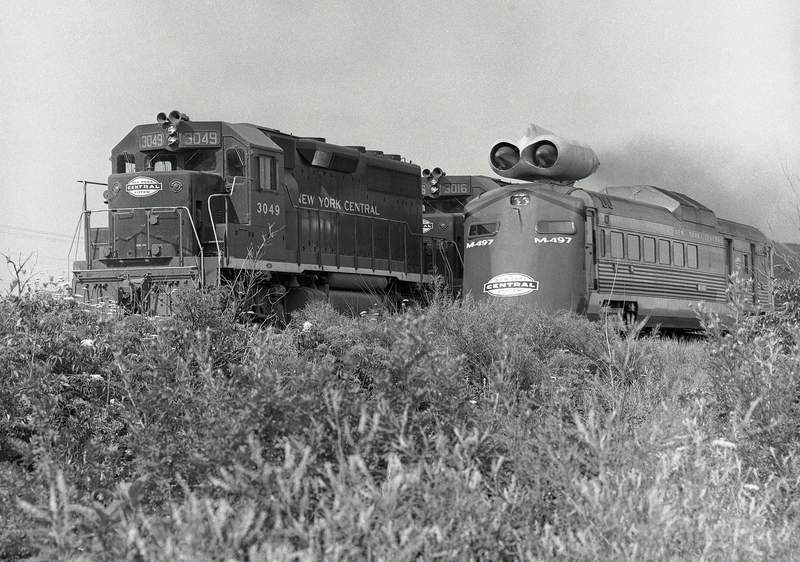 File photos A jet-powered experimental train, right, from the New York Central Railroad begins to pass a conventional train on its first test run on July 23, 1966. The car designated M-497 had a slanted nose and two jet engines attached to the roof. The modifications earned it the nickname Black Beetle. Most seats had been removed from the converted club car and everything was bolted down. Engineers operated the tests from the back of the car. I saw those words while flipping through The Journal Gazette's film files and I just had to stop and pull the envelope out. Inside was a single film negative with what looked like something out of a retro sci-fi flick trying to predict what the future was going to look like. It turns out, that's kind of what the train was. 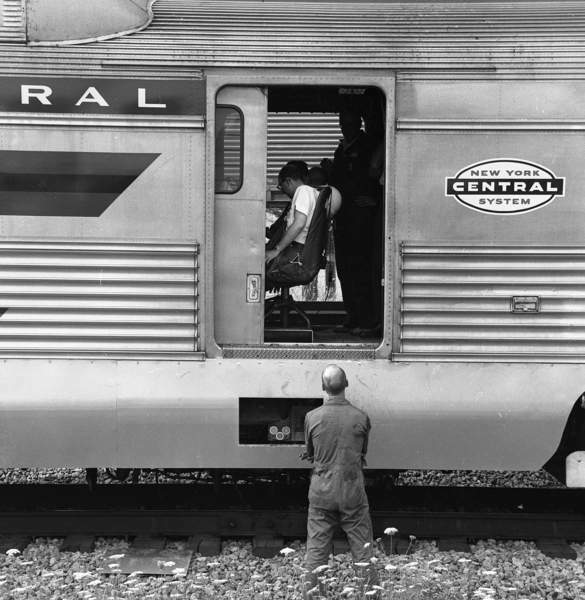 According to stories in The Journal Gazette on July 23 and 24, 1966, the train was a jet-powered experiment of the New York Central Railroad which tested its speed on a stretch of track between Butler and Bryan, Ohio. At the time, the Wall Street Journal said the New York Central was considering ways to set up quick shuttle services between cities less than 200 miles apart. The train – really a single converted club car with engineers in the back and room for passengers in the front – had a slanted nose and two Air Force jet engines on top. The car was said to resemble a black beetle, which became its nickname. In tests July 23, the Black Beetle traveled down a stretch of the track as a plane believed to be carrying railroad executives circled low above the route. Though the tests were meant to be kept quiet, hundreds of residents showed up along the test route to see the train zip by, be towed back to the starting point and then zip by again. Guards blocked crossings and kept traffic off bridges over the tracks. In an interview posted in 2014 on General Electric's website, railroad engineer and former military pilot Don Wetzel, who operated the car during its tests, gave details about the project. 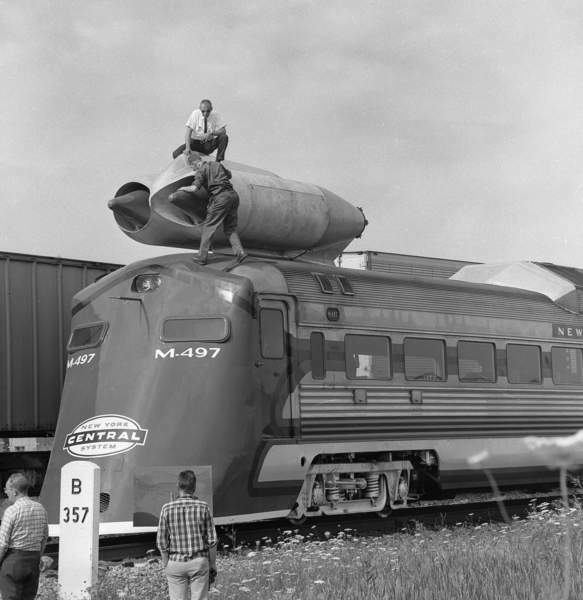 GE made the 5,000-horsepower Air Force jet engines that were purchased on the surplus market and attached to a 13-year-old Budd “Beeliner” Rail Diesel Car. Wetzel's wife was a commercial artist who created the streamlined design for the car, which had the designation M-497. The peak speed of the July 23 tests was recorded at 183.68 mph, though Wetzel says in the interview that the car had actually gone faster and was timed while decelerating. The Black Beetle never left the experimental phase. According to Wetzel's interview, the jet engines were removed and the car was refurbished and put into regular service until 1984. As it turns out, there was nothing atomic about the train – its engines had been converted from jet to diesel fuel. But its futuristic, sci-fi look no doubt inspired some hyperbole on the part of whomever typed up the label in our archive decades ago. Whatever fuel was used, this piece of area history was worth stopping to find out more about. History Journal appears monthly in print with additional items weekly on The Journal Gazette's website. To comment on items or suggest dates and topics, contact Corey McMaken at 461-8475 or cmcmaken@jg.net. The following stories appeared in The Journal Gazette in 1966. A test of an experimental jet-powered New York Central locomotive between Butler and Bryan, Ohio, over a specially prepared 30-mile stretch of track is scheduled to begin today, it was learned yesterday. The railroad refused to confirm reports that runs would begin today to test the high-speed train between nearby cities. The train, with an estimated speed of 225 miles an hour, is expected to be run at slower speeds the first two days of the test. A story in yesterday's Wall Street Journal said that the New York Central is considering a plan to drop its long-haul passenger service and set up a shuttle service between cities less than 200 miles apart. Thus the NYC hopes to make its passenger service profitable. Roger Hilkert of Radio Station WONW in Defiance, Ohio, said the engine apparently came into Bryan under its own power. He described the special engine as being converted from a club car with passenger space in the front. He said the engineers sit in the back and use television monitors to see the track. Hilkert said New York Central president Alfred Perlman and other railroad executives, engineers and designers came in with the experimental car. The engine, in appearance, was described as resembling “a huge black beetle” with a slanted nose and two Air Force jet engines. One representative of the railroad, not identified, said the tests were being kept quiet as a safety precaution, to avoid gathering of crowds. The Wall Street Journal story said: “The road is re-emphazising that it can't compete with the airlines on long runs such as Chicago-New York, but is giving notice that it intends to become a major factor in short-haul transportation. “The Central's approach – a modern day version of the old interurban systems – surely will meet with much opposition. Railroads seeking to abandon passenger service are consistently met with strong attacks from the dwindling number of train riders. Some of these people don't drive cars and are afraid to fly. Others simply prefer train travel. BRYAN, Ohio – A jet-propelled New York Central Railroad car roared down a 17.2-mile stretch of track Saturday in a noisy test that could be a preview of a new era in fast track transportation. The speed of the “Black Beetle,” as it was dubbed, was estimated unofficially by veteran railroadmen at more than 100 miles per hour at the peak of its first test from Butler, Ind., to Bryan in northwestern Ohio. Top officials of the railroad, including Alfred Periman, president, as well as designers and engineers, were reported on hand for the test runs. During yesterday's test, a multi-seat plane circled low over the test route. It was believed carrying the NYC executives and observers. While railroad officials declined to comment, unofficial spokesmen said the test was aimed more at determining engine performance than speed. Eventually, in Sunday and Monday tests, they believed, the train would seek a top speed of 225 m.p.h. or more. One observer who had gained entrance to the car said all the seats had been removed and everything bolted down. After the test run, the car was towed back to Butler. Earlier, the Wall Street Journal had reported that the New York Central plans to try to drop its long-haul passenger service and set up shuttle service between cities less than 200 miles apart in an effort to make its passenger business profitable. None of the conjectures or reports have been confirmed by the railroad. The reports included one that the car was built by the Budd Co., for many years a builder of street and trolley cars. New York Central public relations director Eric Woolfall told a Toledo Blade newsman that the NYC was studying tests and graphs of the train's speed. Woolfall said the company wants to evaluate all the tests and will hold a press conference “sometime” this coming week to release details. Hundreds of residents of the area flocked to see the vehicle as it flashed down the rails from Butler, to Bryan, was towed back to the starting point, then loosed again at even faster speeds. Railroad and police guards, keeping tabs on the beetle's progress by walkie-talkie, blocked off crossings as it approached, and kept all traffic off bridges over the tracks.